This PDF 1.5 document has been generated by PScript5.dll Version 5.2.2 / Acrobat Distiller 10.0.0 (Windows), and has been sent on pdf-archive.com on 25/09/2016 at 06:03, from IP address 36.73.x.x. The current document download page has been viewed 281 times. File size: 241 KB (7 pages). 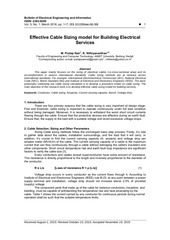 main objective of this research work is to develop effective cable sizing model for building services. There are four primary reasons that the cable sizing is very important at design stage. flowing through the cable. Ensure that the protective devices are effective during an earth fault. Ensure that, the supply to the load with a suitable voltage and avoid excessive voltage drops. factors to verify the cable size . Every conductors and cables except superconductor have some amount of resistance. operation shall be such that the suitable temperature limits. the base current rating with each of the derating factors. product of all the derating factors. Motors are normally protected by a separate thermal overload (TOL) relay. of the cable. Most cable manufacturers will quote a cable’s resistance and reactance in Ω/km. be used in the absence of any other data. Where the protective device is is a semi enclosed fuse to BS 3036, Cf=0.725 otherwise Cf=1. circuit at ambient temperature. For cables installed above ground Cs and Cd =1. (Ω/km) cos ø is the load power factor (pu) L is the length of the cable (m). bigger cable size should be preferred. minimum voltage, then the appliance may not work appropriately. corresponding to different cable sizes in order to speed up the selection of similar type cables. withstand the largest short circuit. and the initial and final conductor temperatures as per equation 12. The conduit is mounted on a wooden wall. sheathed cable may be higher. the current-carrying capacity may be higher. factor k4 for different configuration of cables which has been laid directly. laid directly in the ground . the selection process without resorting to simplifications. equipment - Wiring systems&quot; is the IEC standard governing cable sizing. 2009. National Electricity Code (NEC), 2011.
includes a section covering cable sizing in Article 300. 2011.
standard for IEC 60364 in the United Kingdom. 2008. Research Journal of Engineering, Technology and Innovation. 2012; 1(4): 097-102. Coker AJ, Turner WO, Josephs ZT. Electrical Wiring. Redwood Press Limited. 1991: 12 – 28. This file has been shared by a user of PDF Archive. Document ID: 00486771.